When Colie's mother, the famous fitness trainer Kiki Sparks, jets off for a European tour, she leaves Colie in the tiny seaside town of Colby to live with her aunt Mira, an overweight and eccentric artist. Colie would rather be anywhere but there, where most of the town's rude and judgmental behavior toward her aunt reminds her of her own treatment back at home, and where the people aren't so weird. But then she meets Isabel and Morgan, two best friends who give her a job at the Last Chance Bar and Grill and take her under their wing, and Colie discovers she has a lot to learn about friendship and love. Keeping the Moon is a thoughtful and honest book. Colie's insecurity about her appearance and how she is perceived is a bit refreshing in a heroine, and her uncertainty at how to act and reminders of the pain she has endured will resonate with many teen readers. She's cautious when it comes to getting close to Mira, Morgan, Isabel, and Mira's tenant Norman, but each person has something to teach her. From Mira, she discovers that it is possible to live the judgment of others and not let it affect you, and despite Isabel's tendency to be rude and Morgan's obliviousness to her bad boyfriend, they are compassionate and giving and give Colie the chance to find the confidence and strength she needs. 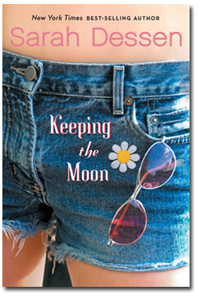 Dessen has created a sweetly romantic book in Keeping the Moon, and the eclectic characters and humor make these old and important lessons on love and friendship and self-confidence seem fresh. Cover Comments: Though this cover certainly isn't the most stylish one, I like it a lot and I think it really fits the book well. It is giving off a lot of great summer vibes, which I just love! I have the original cover and I like it better (the one with the moon and the butterfly). This book was one of the first of hers I read and I liked it very much. I really liked Norman and Mira.